Go to the freestanding climbing rock nearby and grab onto the crevice. Jump back to grab the horizontal bar. Swing around it and jump to grab the vertical bar. 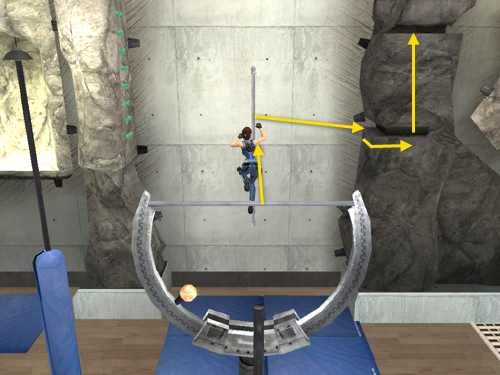 Jump to grab the horizontal bar on the C-shaped frame. Swing around it and jump to grab the vertical bar mounted on the wall. Jump to the right to grab the crevice in the dark rock formation. 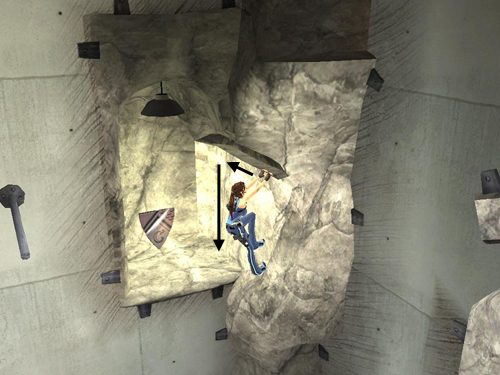 Climb around the corner to the right and then jump up to grab the higher crevice. Again climb around to the right. 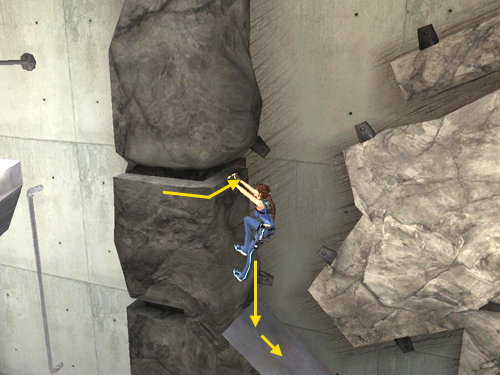 Drop onto the slope, and before Lara can slide off, quickly press Jump (no need to jump in a particular direction). . .
. . . to leap and grab the horizontal crevice on the light gray rock to the right. 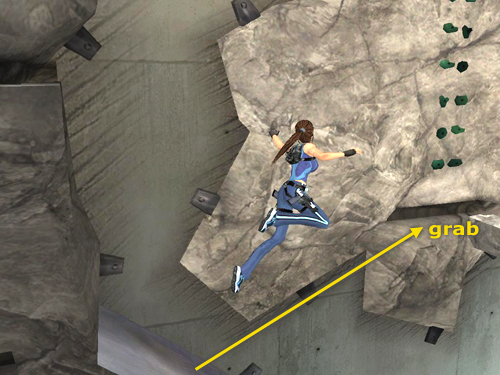 Jump straight up to grab the green handholds. Climb up then jump to the right to grab the horizontal crevice in the same rock. 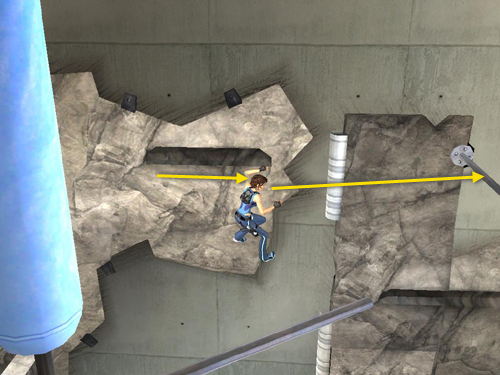 Climb along the crevice to the right as far as you can. Jump to the right to grab the first of two horizontal poles extending from the wall. 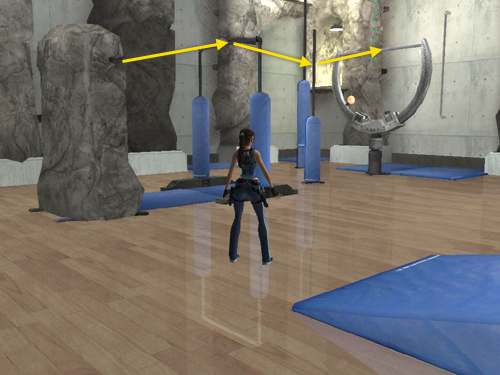 Swing around and jump to grab the second horizontal pole. 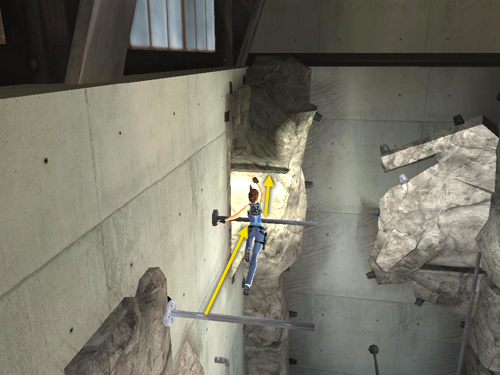 Swing and jump from the second pole to grab the crevice in the corner rock formation. 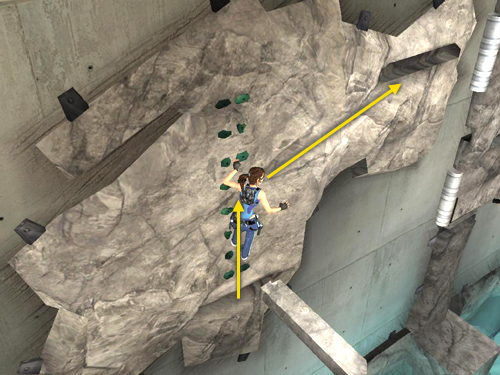 Traverse to the left and drop into the alcove with the bronze reward (14/16). Copyright © 2006- - Stellalune (). All rights reserved. The screenshots and videos included here were made using Fraps. Feel free to copy or print this walkthrough for personal use. By all means, share it with friends, but please include this credit line so people can send me their feedback. No part of this walkthrough may be reproduced on another site without permission.